"Was Ruby Bridges old when she fought racism? No, she was not. She was a kid. Ruby Bridges deserves a monument because she fought racism by herself." 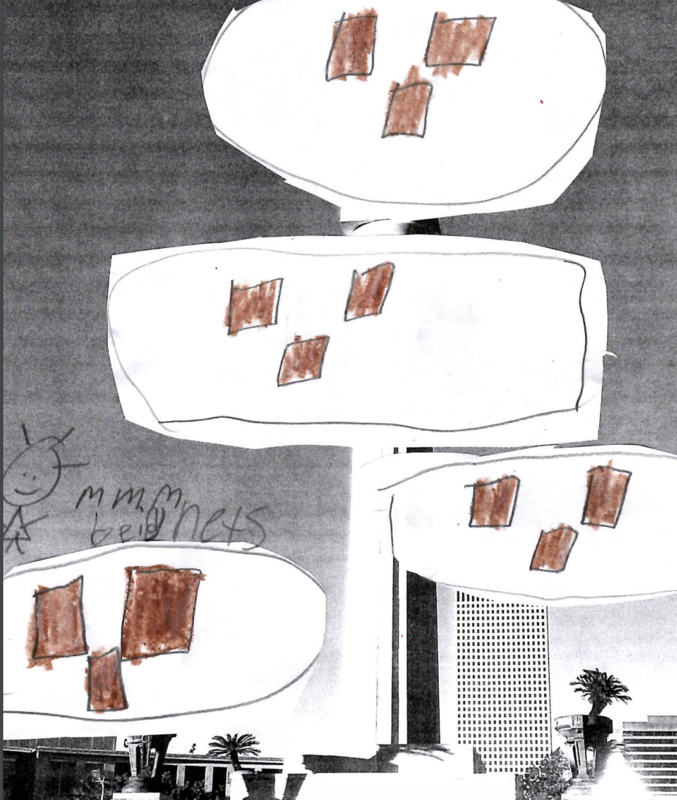 A group of third-graders came up with the most amazing ideas when they were asked what should replace Confederate monuments being torn down in their city, and now their drawings and proposals have gone viral. The kids from Homer A. Plessy Community School in New Orleans worked on the project with their teacher, Aimee Dickerson, and with the help of nonprofit 826 New Orleans. 826 New Orleans is a local chapter of 826 National, which works with kids to provide "opportunities to improve their writing skills and explore their creativity." The project was spurred by the removal of four Confederate monuments from the city in May 2017. 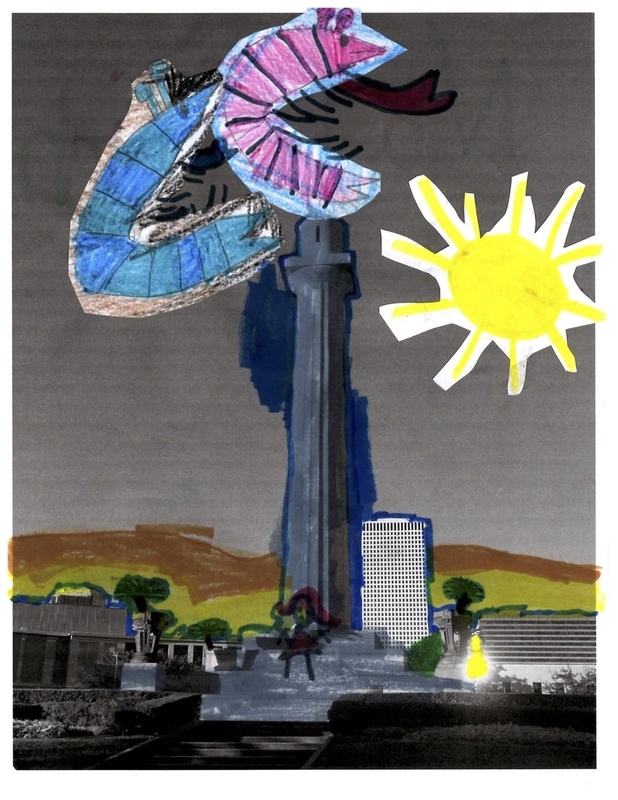 Dickerson asked her students what sort of monuments should take their place, and they created a book with drawings and descriptions of their proposed monuments. "Aimee and her students talked about who or what people, places, things, ideas, or events would be appropriate for commemorating in a public space, a space meant for all people," 826 New Orleans said. The entries are pretty brilliant. 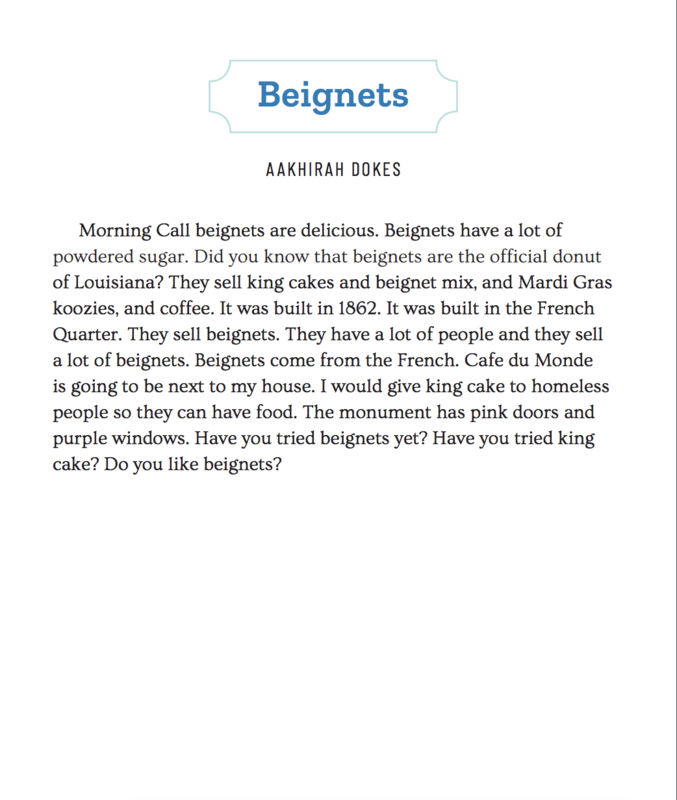 Take, for example, Aakhirah's VERY persuasive argument for a monument to beignets. "I would give king cake to homeless people so they can have food. The monument has pink doors and purple windows," she wrote. 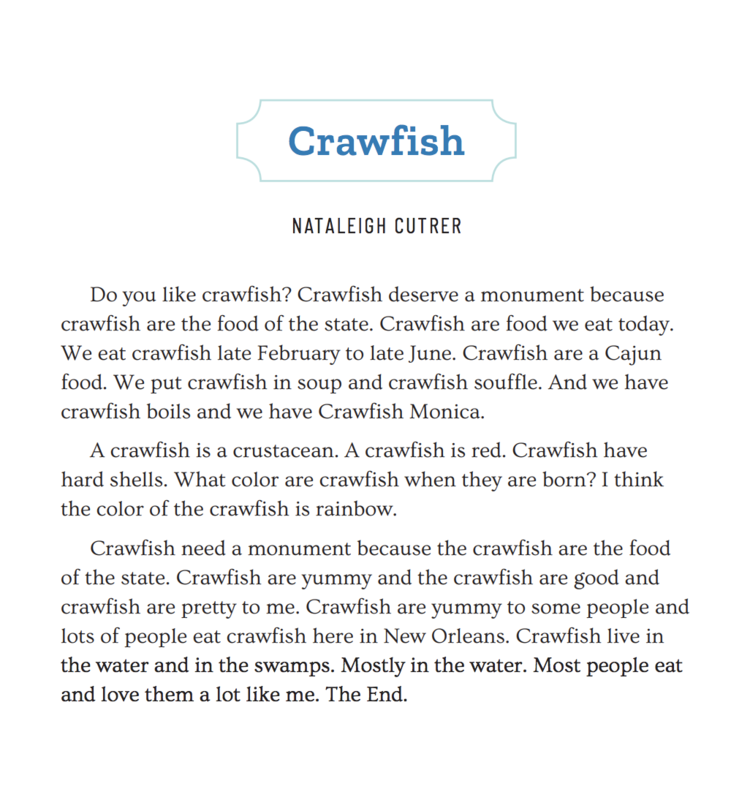 Or Nataleigh's proposal for a monument dedicated to crawfish, a very New Orleans choice. “Crawfish need a monument because the crawfish are the food of the state. Crawfish are yummy to some people and lots of people eat crawfish here in New Orleans," Nataleigh concluded. Other kids picked new historical figures to replace the ones of old. Abigail picked Solomon Northup, who in her words, was " the greatest slave that escaped." "Solomon Northup was brave, loyal and smart. This is also one of the reasons he should have a monument," she wrote. Or Coby, who picked Ruby Bridges. "Was Ruby Bridges old when she fought racism? No, she was not. She was a kid. Ruby Bridges deserves a monument because she fought racism by herself," Coby wrote. After the project was done, it was made into a real book the kids could enjoy. They were pretty stoked! The kids finished the project in the fall, but their book recently caught the eye of author Daniel José Older, who was visiting the nonprofit's office. He tweeted out some of the pages, and people on Twitter fell in love. People couldn't choose what monument they wanted. @djolder @ethiopienne @826neworleans Maybe the monument should be Ruby Bridges, the Houma people, and an alligator all sitting at a table sharing a heaping plate of Beignets and we can dust the foundation with powdered sugar. But everyone agrees they should become a reality. @GeauxSavy @djolder @826neworleans I'm sure there are enough vacant (or soon-to-be) pedestals needing filling with authentic celebrations of New Orleans culture to accommodate all of these ideas. The Giant Beignet could become the Big Easy's version of Randy's out here! Doug Keller, the nonprofit's executive director, told BuzzFeed News the group had no idea Older was going to tweet out the images, but they were "thrilled" everyone was getting to see the kids' book. “It's the purpose in publishing student work," he said. If you'd like your own copy of the book, titled Courageous, Eccentric, Diverse: New Monuments for New Orleans, you can order it here.